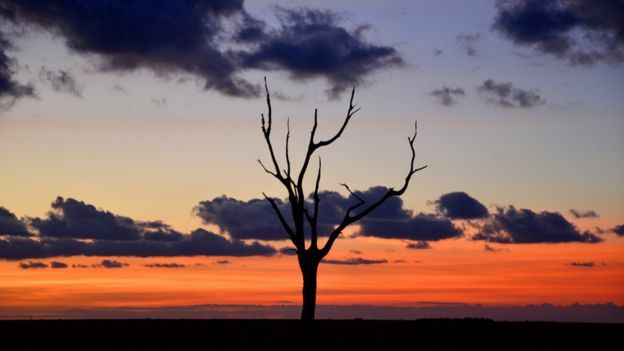 Louisiana’s coastal wetlands are eroding – more than a football field of land is lost every hour. 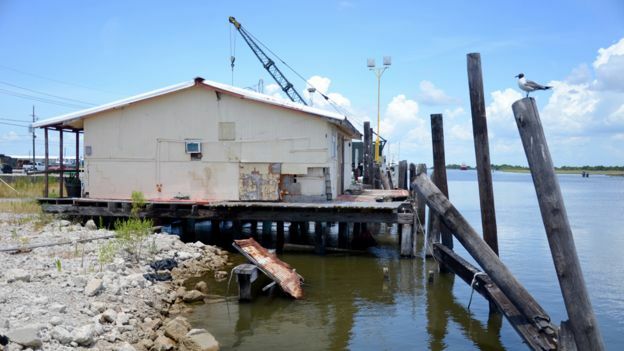 As the marsh erodes, homes, communities and the local Cajun culture are under threat. Paul Chiquet is not your typical librarian. But then again, South Lafourche Public Library is not a typical library. “I said one day we’re gonna build us a beautiful place, and the dream came true, we did it,” he tells me, at a volume which suggests he might struggle in a more classically bookish environment. The unlikely vessel for Chiquet’s dream is a former Walmart store, an unlovely slab of concrete in a lovely location. Outside, Bayou Lafourche wends its way past the parking lot. 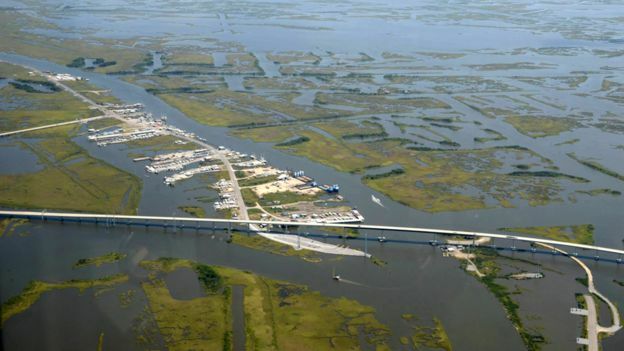 It’s one of the many slow moving waterways here in the delta where the Mississippi river meets the Gulf of Mexico. Inside, books are only half the story. “I was determined this library was going to be like no other library,” says Chiquet, leaning on his walking stick in a room full of display cases, maps, paintings and photos. There are models of fishing boats, and several pirogues, the traditional flat-bottomed canoes used to travel around the marshes. Life on Bayou Lafourche revolves around the water, and Chiquet’s dream is to document the history of the bayou and the lives lived on it. 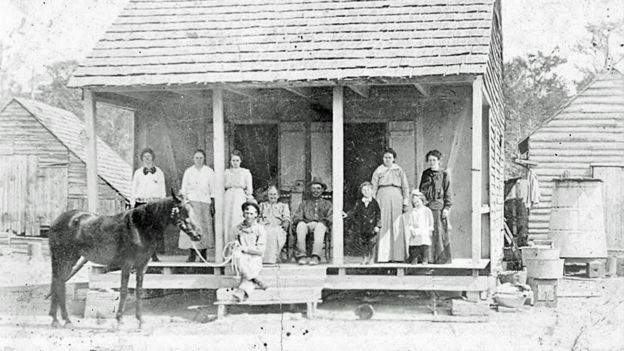 Cajuns are descendants of French immigrants who moved to southern Louisiana in the late 18th Century. 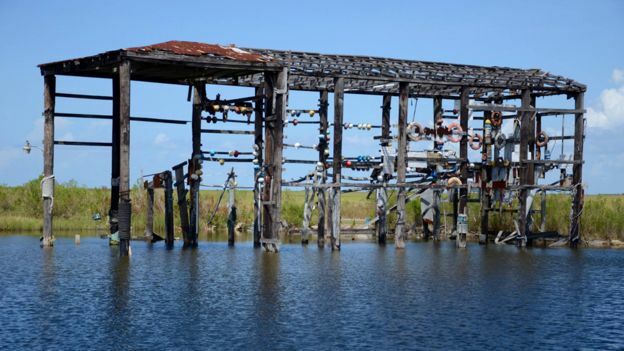 Local names reflect the heritage – Cheramie, Guidry, Terrebonne. “It’s farming, it’s trapping, it’s the seafood industry,” Chiquet says of the traditional Cajun lifestyle captured in his archive. “They still have the boats, they still go fishin’, they still go crabbin’. And it’s still a family community where you sit on the front porch and every Sunday you do the ‘veiller’,” he says, using the Cajun French word for conversations on the porch with family and friends. Losing Louisiana is broadcast on Crossing Continents on BBC Radio 4 at 11:00 on Thursday 27 August. It’s also on Assignment on BBC World Service on the same day or you can catch up later on the iPlayer. One display case documents the first settlement on the coast, at Cheniere Caminada. 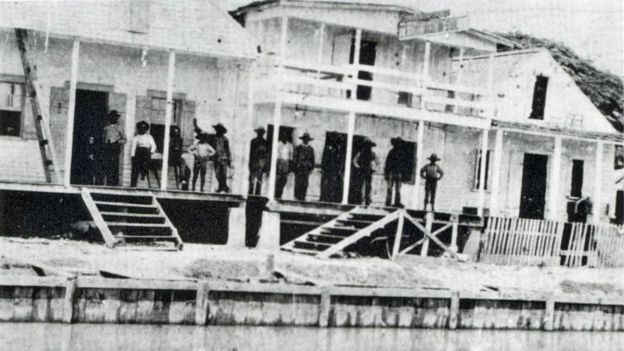 When that was destroyed by a hurricane in 1893, people moved up the bayou. 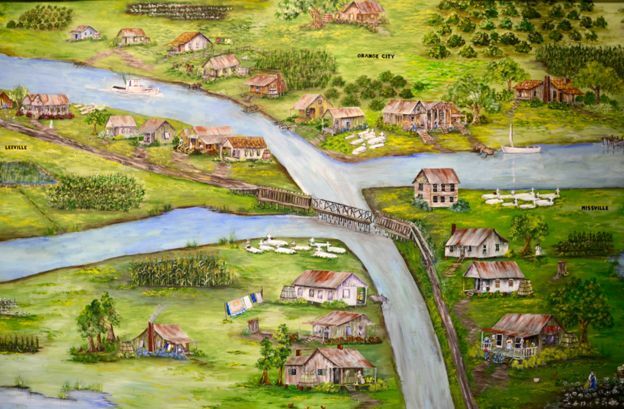 At the junction of two waterways, they established towns on each corner – Missville, Orange City, Old Orange City, and Leeville. It’s no surprise that the people in these faded photographs are now gone. But it’s striking to learn that many of the places they show have gone too. 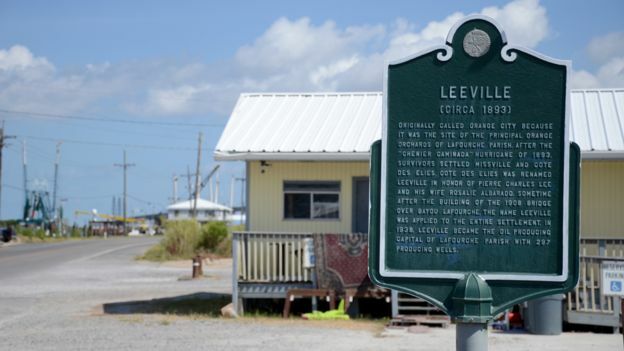 Harris Cheramie sits on the porch of the Leeville Seafood restaurant, and looks out over the town’s one dusty street. It used to be the main road to the coast, but a new elevated highway now curves around the town, bypassing it completely. 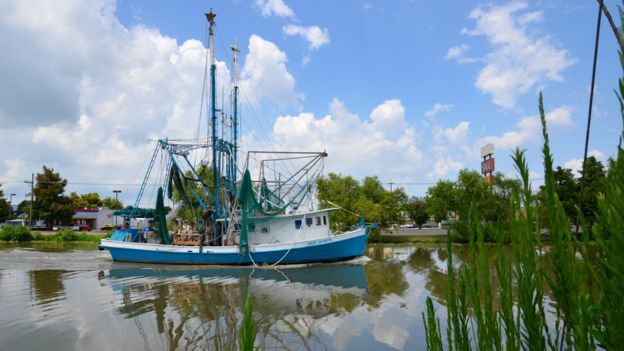 Cheramie has run Leeville’s only restaurant for 18 years, serving gumbo, shrimp etouffee, crab, oysters and other Cajun specialities to residents and people who come here for the fishing. He’s watched the town’s population and size dwindle. Missville, Orange City and Old Orange City no longer exist. Leeville is a shadow of the vibrant town depicted in Paul Chiquet’s displays. What was once home to several hundred families now only counts a few permanent residents. 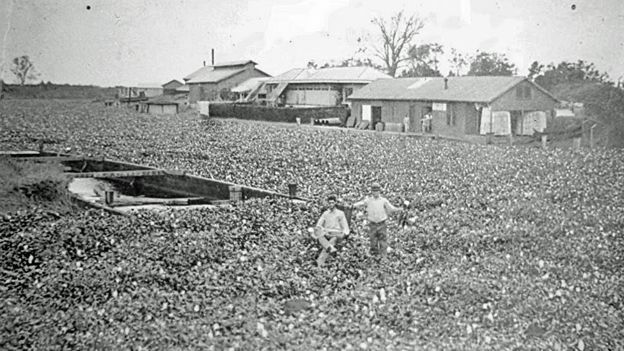 Where there were cotton fields, there’s now open water. 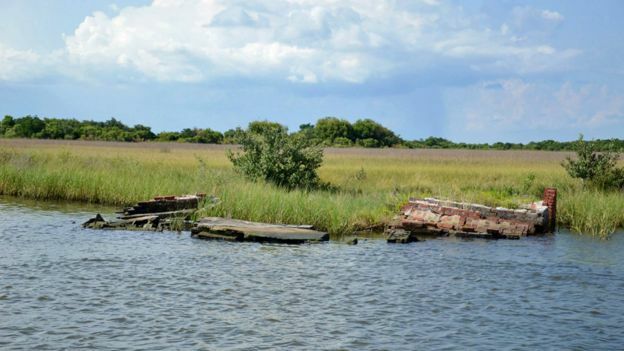 Where a cemetery once stood, a few last remaining tombstones are sliding into the bayou. The people here have survived hurricanes, including Katrina in 2005, and the BP oil spill in 2010. 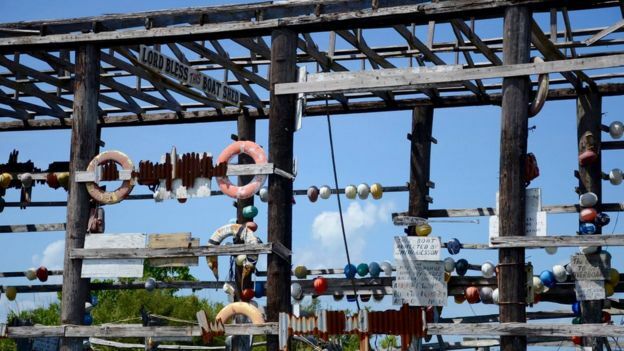 But their resilience is being tested again by a less dramatic, but no less dangerous threat – the long-term erosion of the marshes and wetlands that surround Leeville and run all along Louisiana’s coast. 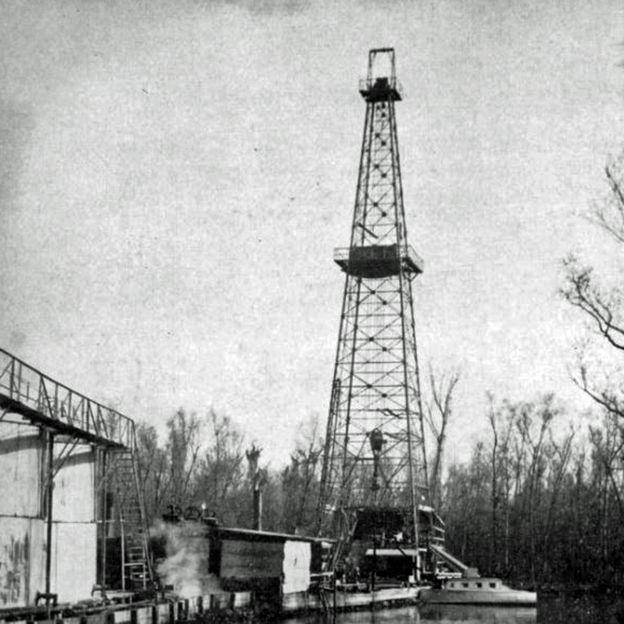 The land here in the Mississippi delta was created by sediment carried downstream by the river and deposited when it flooded. Then in the early 20th Century the US Army Corps of Engineers built a system of levees so that the Mississippi wouldn’t breach its banks. This made life a lot safer for people living on its banks. But with no fresh sediment to build up the land, it began sinking. Add in damage from the hurricanes that regularly ravage this part of the coast, from saltwater that creeps inland and kills vegetation, and from the canals dug by the oil and gas industries, and it’s a slow-motion environmental disaster. More than a football field of land disappears every hour. 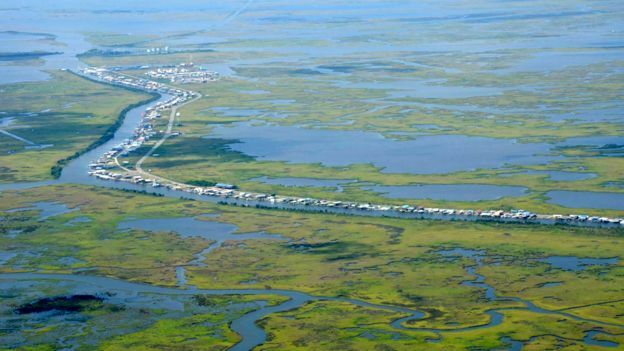 As the land erodes, people in coastal communities move “up the bayou” – inland to bigger towns and cities. But as the smaller coastal communities are dispersed, traditional ways of life are under threat. It’s not just the language that he sees disappearing. One place Cajun French does survive is in song lyrics. Roland Cheramie (no relation) works in a car dealership, but his real love is traditional Cajun music. “It’s music that was written by my ancestors, it tells our story,” he says. As the sun sets, he plays me some tunes on his fiddle, singing about Bayou Lafourche with a raw, heartfelt intensity. “A Cajun is someone who loves and lives and laughs, somebody who loves to cook, loves music, loves to live,” he tells me. He says that the movement of people up the bayou is affecting music too. 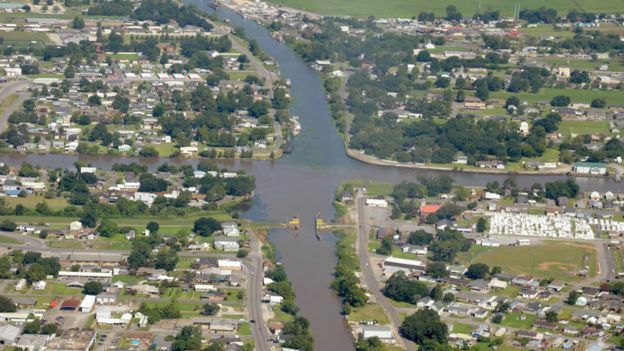 Roland lives further up the bayou in Golden Meadow, which unlike Leeville is protected from erosion by a levee. But he doesn’t feel safe. At South Lafourche High School, a mural in the entrance hall portrays the hallmarks of Cajun life – pelicans, an accordion and fishing on the bayou. We’re gathered with a group of students, and teacher Lonnie Rouse gives them a Cajun pop quiz. “How many of you know how to weave a net?” he asks. A chorus of “no” comes back. There’s a similar answer when he asks if anyone could build or repair a pirogue. “Twenty years ago, every student would know how to weave a net,” he says. It’s easy to view the past through rose-tinted glasses. But it’s also easy to see why people would prefer smartphones and modern amenities to tying nets and endlessly rebuilding after hurricanes. The reality is that many young people growing up here will end up moving away from the coast. Chiquet’s adult sons have moved up the bayou, and when we meet he’s in the process of doing the same. The main driver is flood and hurricane insurance, which he says will fall from $5,500 (£3,500) to $1,500 (£955) per year when he and his wife move from Galliano to Raceland, further away from the coast. But they’re leaving a house that has been in her family for 132 years. “That’s a beautiful big Cajun home, four generations that house has been there,” he tells me. But there’s a stark imperative pushing them. 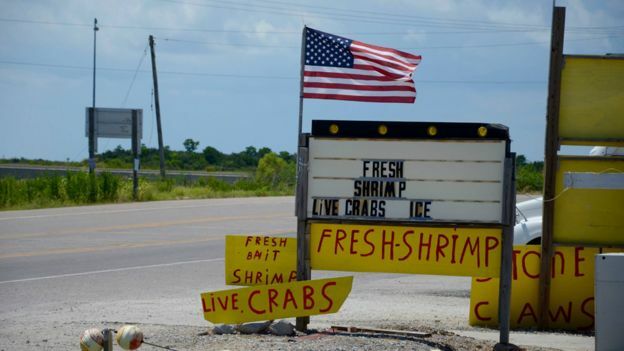 Reduced to its simplest elements, Cajun culture may well survive. There will always be Cajun music in the bars of New Orleans, and shrimp etouffee on the menus of its restaurants. 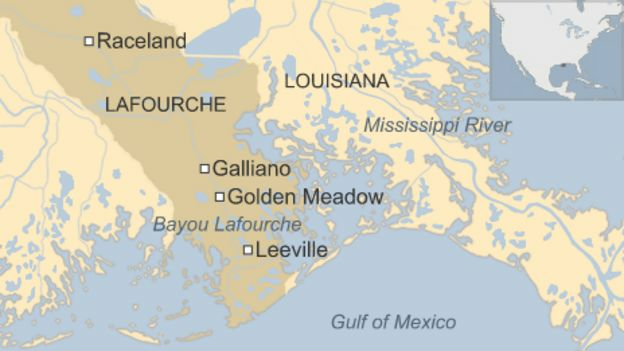 But what Paul Chiquet, Harris Cheramie and other people I met on Bayou Lafourche are lamenting is something more than the sum of its parts. Like most people I met here, Paul Chiquet reflects on this with a mix of regret and pragmatism. Cajun life isn’t about complaining, it’s about getting on and making the most of what the land and coast has to offer, no matter what that is.